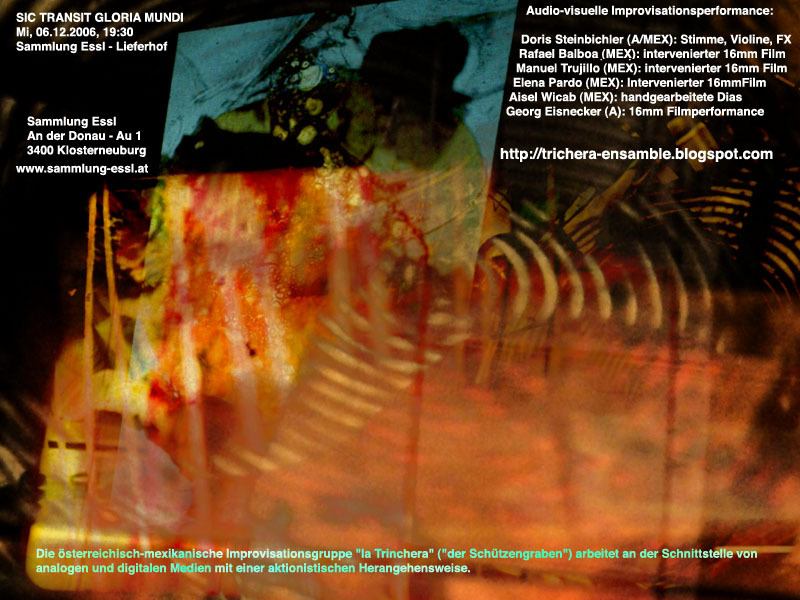 La Trinchera is a projections / music improvisation group founded by Doris Steinbichler, Rafael Balboa and Maurice Trujilla. Cedric Lépine writes for Fiches en Cínema , in French, as found on le blog. Short Clip of Mexico's 2005 Festival de Mayo in Guadalajara, featuring an ealy performance by La Trinchera. Screened on ORF, Austria's National TV Station, 7Mb, 3 minutes (Mov file). (Sammlung Essl) Long length 21 mins of Sic Transit Gloria Mundi on Trinch-Ens blog post. 128Mb, click on Play in GoogleVideo box. E Pluribus Enum" Pictures by Gosta Tendberg. (Sammlung Essl) Sic Transit Gloria Mundi. 5 minutes, 20Mb (Mov file). Museumsquartier 15th November 2006. 10 minutes, 43 Mb (MP4 file). (Museumsquartier) "streaming to Estonia" 16th November 2006. 20 minutes, 51 Mb (Mov file, needs Mimetypes set). (Monochrom) Taugshow #9 0th December 2006: robot with La Trinchera backdrop. 24 secs, 6 Mb (Mov file). (Sammlung Essl) Flyer -- Sammlung Essl. 170 kb. Email-sized flyer.